Every heard the term "Quiet Time"? Do you know what a Quiet Time is? Tim Keller describes it this way, "a time of direct contact between your mind and God's using the Bible and prayer." Is this kind of time a regular part of your life? Would you like it to be? Ignite Youth Ministries has been using a resource for almost a year now that has proved very helpful in guiding high school students and adults in daily devotions, and we want to offer it to you! 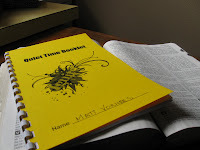 It's called a Quiet Time Booklet. Click on the link above to access a printable PDF version. You will need to print it doubles-sided, so a printer with duplex capabilities is really handy. Once printed you will want to add a piece of cardstock for a cover, so decorate it however you'd like! Then you can either cut it in half and bind the pages, or fold and staple them. Enjoy meeting with the God of the universe who did not spare His own Son to establish a relationship with you!